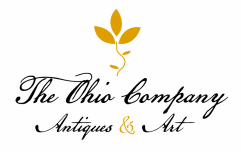 The Ohio Company sells quality antiques and art of many types and at all price points, and we particularly love objects made or used in the Ohio River Valley and Midwest. Furniture, glass, pottery, metals, textiles, paintings, prints, historical artifacts and ephemera, early photographs are all of interest to us! the type you see in our Notable Sales gallery. ​1846,now in a private collection.